Did you know that the Waldensian Church is the oldest evangelical church in existence, having begun 350 years before the Reformation? And did you know that a group of Waldenses came from Italy to North Carolina in 1893 and founded the town of Valdese? It is unusual to hear of Italian Presbyterians, but we will learn much more about them at our fall meeting on Oct. 11. Nonetheless, the church had preachers, both men and women, who traveled secretly and met with congregations in homes. The movement survived primarily in the secluded valleys of the Cottian Alps between France and Italy. When the Reformation took hold in Europe, the Waldensian churches voted to align themselves with the reformers in Switzerland, led by John Calvin. They had a long tradition of translating parts of the Bible, and they assisted Calvin in producing the first complete Bible in French. In 1685 the French king revoked the Edict of Nantes, which had granted religious freedom, and sent an army into the Valleys. Many were massacred or died in prison. Those who converted to Catholicism were sent to other parts of Italy or forced to be galley slaves. However, some made the dangerous journey over the mountains to Switzerland. Four years later, William of Orange sent troops to help them regain the valleys. This “Glorious Return” is celebrated in Valdese with a festival every August. In 1694 the Duke of Savoy granted them religious freedom, and in 1848 the Waldensians were finally granted their civil liberties as well. With peace came prosperity and increased numbers – more than could be supported in the small Alpine valleys. Groups left to settle in South Africa, South America, and the U.S. Eleven families were the first group to come to North Carolina, arriving in 1893. They formed the Valdese Corporation and purchased about 10,000 acres to be held in common. More families came in the next few years. In 1895 they voted to unite with the Presbyterian Church, U.S. The Romanesque-style church building was begun in 1897 and completed in 1899. Among themselves, the people spoke a patois based on Old French, and Sunday services were in French, except for one service a month in Italian. In their homeland it was most unusual to find a family who had not memorized at least one book of the New Testament, based on their fear that persecution might deprive them of the written word. In America they continued the practice of having children memorize one chapter of the Bible. For centuries the Waldenses made wine in their homes. In 1986 a cooperative winery was formed, whose staff and workers are all volunteers. It is located in a barn built about 1930 from fieldstone. After our business meeting, there will be an optional tour of the winery, which has next to it a covered bocce or boccia court (Italian lawn bowling). As an alternative to the winery tour or as an added attraction afterwards, you may wish to walk the Trail of Faith, which begins at the Trail of Faith Visitors Center, 401 Church St. There are 15 replica buildings and exhibits illustrating the life of the people in Europe and during the early years in North Carolina. It will be open that Saturday from 2:00 to 5:00 p.m. Need a ride to Valdese? Our treasurer, Earl Fitzgerald, will be receiving the registrations for our meeting. If you need a ride, he may be able to put you in touch with someone who could pick you up. His telephone number is 919-876-6665, and his email address is efitzge@intrex.net. For directions, see map below. With a choir’s Korean words of “What a Friend we have in Jesus” and a piper’s playing of “Amazing Grace,” spectators gathered at the entry to the old Historical Foundation on Saturday, May 24, 2008. After an invocation, and welcoming remarks from John Richardson, on behalf of the Montreat Conference Center, PHC board chairman Richard Ray cut the ribbon across the door and the new Heritage Center officially opened to visitors. Clouds that had threatened showers gave way to sunshine as some 200 visitors lined up to sign in and view two exhibits marking the opening: the centennial of the great Korean revival of 1907, and a celebration of 100 years of Montreat history. Spence Hall holds a blend of the new and the familiar. From the ceiling of the lobby now hang flags, colorfully representing some of the countries with a Presbyterian missionary presence. The old reading room has been reopened, and additional resources are being added. Habitués of the old Historical Foundation will be pleased to spot the wood carvings by the Rev. John Mack Walker, Jr., depicting scenes from the Gospels, still on display. Freeland Hall remains closed; it will be converted into meeting space. Already available in the display area are a few PHC-sponsored publications in its Heritage Series: pamphlets on “Historic Churches of Old Mecklenburg County” and “Research at the Presbyterian Heritage Center.” More are undoubtedly on the way. The staff, headed by director Ron Vinson, includes a number of volunteers and part-timers. The Center is already open many hours more per week than the Historical Foundation was toward its demise. Perhaps most interestingly, for those who cannot get to Montreat very often, a lively Web site, www.phcmontreat.org/ , highlights a wide variety ways the Center is fulfilling is mission, and provides links for those wanting more information on numerous topics relating to Presbyterian heritage. Tax-deductible contributions to the PHC’s ongoing growth can also be made on line. The Center relies on individual, foundation, and local congregational support. I hope sometime soon the Society can schedule a meeting in or near Montreat, to let our members see what has been happening and to show our support for this new work. Meanwhile, everyone hopes that the many summer conference attendees will not miss seeing this exciting new project celebrating our Reformed heritage. At our Annual Meeting this fall, an election will be held for two offices: First Vice-President, who serves as Program Chair; and Third Vice-President, who serves as Awards Chair. Mrs. Ann Myrhe has agreed to serve a second two-year term as Awards Chair if elected. Suggestions are welcome for the position of Program Chair. Any member may make a nomination from the floor. We all really enjoyed our tour of historic churches in New Bern last April. The weather was great and the gardens lovely. As a port city, New Bern has had a rich and varied history from the colonial period to the present day, and each place of worship brought out a different aspect of that history. The meeting began in the sanctuary of the First Presbyterian Church with its central high pulpit, completed in 1822. Donald Taylor told us about its antebellum history, when many free blacks and slaves were members along with the white townspeople. During the Civil War, New Bern was occupied by Union troops and the church became a hospital. The building was in poor condition by the end of the war, but the congregation survived as an integrated body until 1878, when First Church helped to organize a separate church for colored Presbyterians. That congregation, Ebenezer Presbyterian, was our second host church on Friday afternoon. Ebenezer’s first building was destroyed by the Great Fire of New Bern in 1922. Its present brick structure was built by its members. Rev. Robert Johnson and Mrs. A.B. Bryant spoke about its history and work, and then led us to the Fellowship Hall. There we were greeted by other members and found a wonderful display about the church’s history, filling the whole room. It was hard to pull ourselves away in time for supper! After dinner Mr. Victor Jones of the New Bern Public Library told us about the Palatines, who were the very first settlers at New Bern. The evening closed with beautiful and moving songs of praise by Mrs. Martha Johnson and Sister Mildred LaBoo. Saturday morning we were met bright and early by Mr. Pete Killingsworth at Croatan Presbyterian Church, between New Bern and Havelock. The frame church, built in 1884, has a columned belfry and hand sawn decorative trim around the outside. Several times the congregation has declined after economic changes, but once again it is growing as new families move into the area. 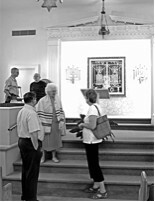 Our next stop was Temple B’Nai Sholem, where Mrs. Barbara Beck met us. Jewish merchants lived and worshipped in New Bern for many years before the synagogue was built in 1908. A Reformed congregation, they have a strong tradition of lay leadership. Across the street is Old St. Paul’s, the oldest Catholic church in North Carolina, organized in the home of William Gaston. On the next corner is Centenary Methodist, the second oldest congregation in New Bern, having begun in 1772. The present curved sanctuary is surrounded by beautiful stained glass windows from Germany. Mr. Larry Lovvorn, our host, also showed us the lovely chapel and baptismal font. Just down the road we were met by Mr. David Skaggs in front of Christ Church, established in 1715. In the old cemetery the foundations of the original church are marked, with stone seats inside its space. The present building was built in 1871 and is almost identical to the 1824 structure, destroyed by fire. Inside we saw the silver communion service and Bible given by King George II. Finally, at First Baptist, we were greeted by the son of our long-time members Earl and Penny Fitzgerald — Rev. Steven Fitzgerald. Baptists have a long history in New Bern, beginning in the 18th century. The building itself dates from 1848 and was also occupied by Union troops during the Civil War. The congregation is very active in the community. Lunch at Morgan’s in downtown New Bern was followed by a brief business meeting, during which Mrs. Ann Myrhe announced that awards were given for two books: Pioneer Presbyterians: Rev. Colin McIver and Rev. John D. McFarland by Rev. John H. Jackson and Mrs. Bess Lane; and Journey to New Hope: The History of new Hope Presbyterian Church, 1756-2006 by Barbara A. Murphy, M.D. This brought an end to our formal meeting, but many members stayed a while to visit the gardens of Tryon Palace or one of the museums or historic houses. Where did all the Historical Foundation materials go? In 2006, the General Assembly of the Presbyterian Church (USA) voted to close the Montreat Office of the Presbyterian Historical Society, which had formerly been known as the Historical Foundation for the Presbyterian and Reformed Churches, Inc. It was decided that the large collection of church archives, manuscript materials, photographs, books, microfilm, and artifacts that were housed there would be divided among three repositories. Your editor has been trying to find out what went where, and how to access them. The following is my report. If you are trying to locate something that you know was at Montreat, the first place to call should be the Presbyterian Historical Society in Philadelphia. Their in-house archives database contains the list that was made of all the materials removed from Montreat and where each item or collection was sent. The reference staff will search that database and tell you, for example, whether a church’s records were sent to Columbia, Philadelphia, or were returned to the church, but not whether the church then sent them to another repository. Unfortunately, they have no plans to make that list openly available to patrons there or on-line, as they say it is too large. About 60% of the materials moved from Montreat went to Philadelphia and the rest to Columbia. The artifacts were not included in the database. and artifacts from missionaries and others that related to the work of the church. I was told that many of the records and collections sent to Philadelphia have already been cataloged in Calvin, but they are not identified as having come from Montreat. [Editor’s Note: It is common practice for archives to include a note in the catalog record about previous custody, but the PHS leadership have made a point of not doing so — even though it would be helpful for a researcher to know that a collection or artifact is indeed the one that was previously at Montreat.] The Montreat finding aids for the manuscript collections are being converted to a standard format so they can be available on-line. and some artifacts, most of which are either from a specific congregation or are related to one of the collections of personal papers. The printed books from Montreat, including church histories, are being added to the seminary library and will be in their on-line catalog. In Special Collections they are compiling a list of the congregational records first and then will move on to the personal papers. They did receive an electronic database from Philadelphia containing the list of what was sent to them, but they don’t have the software to retrieve the data. The on-line catalog at Columbia had also been named “Calvin,” but it is a different system that is not compatible with the Calvin catalog in Philadelphia. Because they are working to identify and verify everything they have received, the Special Collections area for the time being may be visited by appointment only, and only on Fridays. However, they are glad to help you and will reply promptly to all questions that come in by telephone, email, or letter. The library actively acquires by donation similar collections and/or additions to existing collections. The books and personal papers are owned by the seminary; the congregational and presbytery records are on deposit. – the wood carvings of Rev. John Mack Walker, Jr. The Heritage Center does not have a list of the items and collections that were left there after other materials were sent to Philadelphia and Columbia. At present they are busy creating a database of all their artifacts, which they hope to complete by the end of the year. A different cataloging system will be needed for the books and collections, and they hope to one in place and available on-line in the near future. I was interested to learn that the PHC is very interested in building up the collection at Montreat. They cannot take the official records of any church or church body, which, according to the Book of Order, must be kept either at the Presbyterian Historical Society or at a seminary with adequate facilities, or by the church body itself. However, Philadelphia took almost all the personal letters and papers of missionaries, even though they were not official reports. Also, many of the printed histories of individual churches and the vertical files on churches were sent to Columbia. The PHC would like to rebuild its collection of printed church histories, and they are collecting Presbyterian manuscripts, letters, and documents, including those of missionaries, as long as they are not official records. Rooms for Friday night have been set aside for us until Sept. 20 at the Sleep Inn, I-40 at Morganton, Exit 105, at the special price of $51.99 + tax. Telephone 828-433-9000 and tell them this is for the NCPHS meeting. Do book your room in time, as our meeting will be during the fall color season in the mountains. From the east: Take Exit 112 and turn right onto Eldred Street. At Main St. E. (Hwy. 70), turn left, pass two stoplights, and you will see the church on your left. From the west: Take Exit 111. 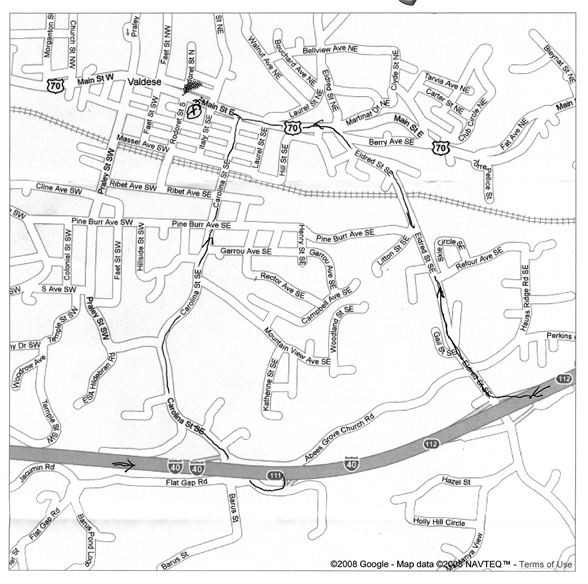 Turn right at Millstone Avenue, right at Carolina Street, and then left on Main Street East. The church is on your left in the second block. Please send this form with your check (made out to NCPHS) by October 5th to Mr. Earl Fitzgerald, 2213 Foxhorn Road, Trent Woods, NC 28562. 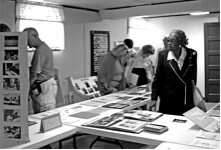 The North Carolina Presbyterian Historical Society will hold its Fall Annual Meeting in Valdese on Saturday, October 11. We will be learning about the French-speaking families from Northern Italy, members of the ancient Waldensian Church, who founded Valdese in 1893 and became Presbyterians! They have an excellent museum, a bakery, a bocce court, and a cooperative winery! For more information or to register, please go to our website at www.ncphsociety.org, or contact Don Saunders, (828) 295-8917, email: saundersdb@appstate.edu.